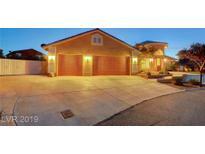 Below you can view all the homes for sale in the Valley West subdivision located in Las Vegas Nevada. Listings in Valley West are updated daily from data we receive from the Las Vegas multiple listing service. To learn more about any of these homes or to receive custom notifications when a new property is listed for sale in Valley West, give us a call at 702-323-5933. Large secondary bedrooms. A CALIFORNIA EXODUS FAVORITE! MLS#2090094. Platinum R.E. Professionals. This is zoned also for horse property. Welcome home!! ! MLS#2087925. Wardley Real Estate. Welcome Home To This Recently Renovated Custom Single Story Home On Half Acre Lot In A Private Cul-de-sac Featuring Dual Rv Gates/ Gourmet Chef's Kitchen With All New Custom Cabinets, Granite Counters And Backsplash/ Stainless Steel Appliances/ Dual Master Ensuite/ Private Pool And Spa With A Full Length Patio And Built In Bbq Grill For Those Entertaining Nights And Many More Upgrades To Get You Excited About Your New Home! ! MLS#2087537. BluePrint Realty LLC. No HOA & close to Summerlin amenities w/o HOA fee's! MLS#2087494. Urban Nest Realty. Door to pool and yard from master bedroom! MLS#2087032. LIFE Realty. Brand new roof with 10 year warranty! This one won’t last! MLS#2086515. Paradigm Realty. Large backyard with new covered patio. Kindergarten attends Piggott Clarence Academy. MLS#2086375. Precision Realty. New White Shaker Cabinets, Grey Quartz Countertops, Stainless Steel Appliances, Flooring, and more! MLS#2084704. ATG Realty Group. Large windows and vaulted ceilings create an open and inviting living room, amazing kitchen with granite counters and high end KITCHEN AID appliances. MLS#2081703. Realty ONE Group, Inc. Pool equip works but pool heater sold "as is". Covered Patio NO HOA MLS#2081733. Realty ONE Group, Inc.
NO HOA!Close to Shopping & Hwys. MLS#2079970. Urban Nest Realty. The low maintenance yard is a private oasis w/ covered patio, fire pit, and ceiling fans. MLS#2079244. Top Tier Realty. WILL NOT LAST*Desirable location next to Summerlin and Golf Courses* Restaurants,Shopping,Schools,places of worship nearby* 1story,3 bed,2 bath,3 car gar with A/C, 8172 sqft lot*Huge walk in closet*Plantation Shutters*Custom gas fireplace*Therapeutic Tub*Alarm*Enclosed Front Patio*Enclosed Patio in back*Covered BBQ Grill w/tile Table*Fountain*Wet Bar*2 A/C Units*Retractable Awnings*Sheds*Plant Window*Skylight*Home Warranty MLS#2076418. Paradigm Realty. Outside Features Rv Parking, Large Circular Driveway, Backyard Has Covered Patio And Sparkling Swimming Pool! ! MLS#2073801. South Bay Realty. Large backyard with a covered patio and private inground pool/spa w/waterfall. MLS#2073438. Orange Realty Group LLC. All three bathrooms has been completely remodeled from the showers, flooring, vanities, sinks, granite counter tops, EVERYTHING! MLS#2072000. Investpro Realty. Also The Current Solar Panels Will Save You Thousands In Bill Over The Years! MLS#2070363. Realty ONE Group, Inc.
,one room downstairs close to many shopping areas and casino in summerlin MLS#2068015. America's Choice Realty LLC. dog run, RV power outlet, New exterior paint,front landscaping & lighting. MLS#2068548. BHHS Nevada Properties. Fantastic Bailey McGah floor plan, 4 bedrooms (1 downstairs), 3 bathrooms, loft, updated kitchen w/ stainless steel appliances, kitchen open to the family room featuring a brick fireplace, a large lot, sparkling pool/spa, covered patio, RV/Boat parking, an oversized 3 car garage and so much more. MLS#2069016. Signature Real Estate Group. Additional Bay Window & Double Pane Energy Saving Windows Throughout, Custom Shelving, Fireplace & Wet Bar! MLS#2067032. BHHS Nevada Properties. Spacious backyard with private pool/spa, covered patio and shed on nearly a quarter acre lot. A must see! MLS#2066856. Black & Cherry Real Estate. Great location near shops, Tivoli, and Boca Park! No HOA, lovely neighborhood! ! MLS#2064979. Realty ONE Group, Inc. Peaceful backyard has covered patio, tree for shade and even a fruit tree as well as sheds for storage. SHORT SALE APPROVED! MLS#2037404. Wardley Real Estate. Hurry Because This Won'T Last Long!! Welcome Home! MLS#2015441. Signature Real Estate Group.